This duck can glide smoothly through what looks like turbulence because the water is actually calm. The peaceful surface of the water merely picks up the image of the atmosphere around it. Sometimes I fail to enjoy the peace the Lord has granted me because I am caught up in the turbulence of the lives of people I care about. It’s a hazard for empathic people whose sensitivity causes them to pick up other people’s emotions. The Bible calls it the gift of mercy. It can be a useful tool, but it is a tool, not a reward, and it needs to be used with skill and wisdom. One of the great frustrations in my life has been the seemingly callous attitudes of people who are oblivious to the pain of others. Nothing stirs up my self-labeled righteous indignation more than non-compassionate people who shrug in the presence of suffering and say, “Not my problem.” It makes me furious! But this week the Lord has been smacking me upside the head (ever so lovingly) about misaligned compassion that is actually a lack of faith on my part. I have discovered 1 Corinthians 12:9,10 to be true in my life. It’s not a matter of self-imposed martyrdom or false humility, but I am learning that it is in the areas where I have been, quite frankly, an utter failure that God is most able to communicate his goodness through me. His goodness amazes me and I love to talk about it. But this is where he called me up on the carpet this week. I admit, I’m bad at the whole boundaries thing. I was an over-responsible eldest child and had my personal boundaries violated so often I don’t have an innate sense of when I need to step back and let God be God. (Yes, Lord, I realize that is an explanation and not an excuse.) I’m still learning. I noticed that parents of my students who applied “tough love” as their go-to position used it on teens who had known precious little “gentle love” in the first place. I felt agony for overachiever-types who were locked out of the house for being five minutes late for a 10 p.m. curfew. On the other hand I have also seen far too many young people grow up with a sense of learned helplessness when their parents ran defense for them with excuse after excuse for their kid’s lack of self-discipline. I’ve also been caught, more than once, pouring more effort into changing someone’s circumstances than they themselves put into changing the habits that got them there. I’ve seen people who haven’t been tempered by adversity presume on the grace of God with a sense of entitlement that reveals a shallow unloving relationship where the Creator of the universe is viewed as their personal Santa Claus. Someone told me the sin of presumption David recognized as a problem in Psalm 19 is assuming God is here to serve your agenda, instead of you being here to serve God’s. But God forgive me, sometimes I’ve been the enabler, and it’s been the result of my own lack of faith. This is what I am learning: God gives plentiful grace for our own circumstances. He has grace in overabundant supply for anyone who asks Him. He does not necessarily give me grace to deal with problems that are not mine. When I am overly influenced by the turbulent atmosphere all around me I lose my peace and when I am worried or afraid I can’t move. I’m no help to anyone. My joy becomes forced and my ability to love is limited to my own willpower. I need to be on solid ground myself before I can throw a lifesaver to a drowning person. 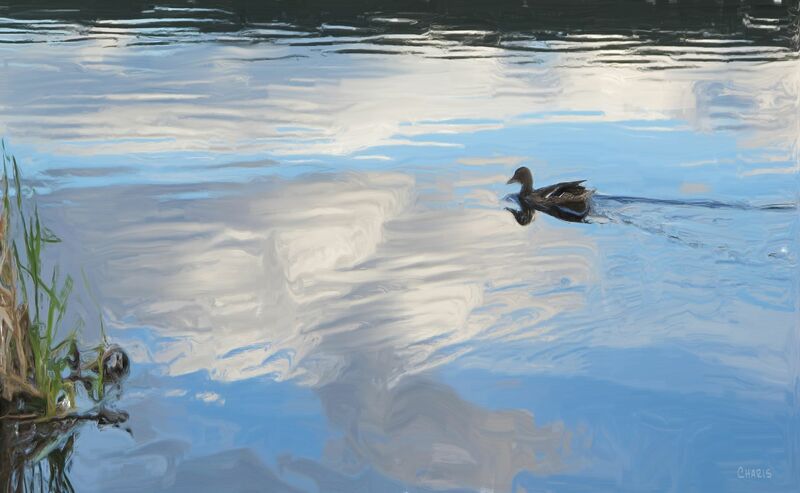 I need, like this duck on the lake, to appreciate the peace that is mine in Jesus Christ and move on that. Sorry, Lord. Give me discernment to stand with you and not for you. Your grace is sufficient for all the people I care about as well. I trust you. We always have more to learn… Thank you for sharing your God lessons. Do you ever feel like you should be much further along by now than you are? I am grateful for His patience. Yes! As I was prayed for at church today – she had an image of “stirring the pot” – I’m thinking – let’s eat!! We must still be in training….He is definitely stirring all around. It’s encouraging to realize He thinks we’re worth the effort. Charis, the Lord has been speaking similarly to me about this very topic. God gives us grace sufficient for ourselves, but we can leave others in His capable hands. He is showing me, too, to appreciate His peace and to let Him be God. I continue to pray for others, but with a new-found freedom. I’m learning to trust the One who brings life and brings it abundantly. Brilliant post! “Appreciate His peace and … let him be God.” This is a lesson that requires a change of identity from “responsible one” to “responsive one.” There’s a big chunk of my mind that needs renewing right there. It’s an essential lesson, isn’t it? So glad you are hearing it too. Companionship on the journey is precious. Amen. There’s wisdom in the balance you’re articulating. Or maybe it’s not a balance so much as what Jesus said: “I tell you the truth, the Son can do nothing out from Himself. He can only do what He sees the Father doing.” The only right thing is what we see the Father doing. You are a blessing! Ah, there’s where I tend to run ahead. I’m actually taking this season out of any church ministry because I know I need to concentrate on hearing better. I heard a podcast by R.T. Kendall recently in which he points out that the man at the Gate Beautiful who was healed when Peter and John reached out to him, must have been at that same gate when Jesus walked by many times before. Was the Father telling Him to leave this one unhealed because it was not yet time? I’m realizing more and more how essential spending time listening to God is. Without seeing what the Father is doing all our good intentions can just screw things up. And yet the Saviour loves us enough to keep changing us.